Knowing about your braces is an important part of yoru treatment. When you are in treatment, you will probably hear many orthodontic terms used by the doctor and staff. You may want to know the common parts of your braces are called so that you can tell us if something is bothering you. Listed below are the common areas on the braces and a drawing to help you identify each. Archwire – The engine that moves your teeth. This metal wire fits into your bands and brackets and guides your teeth to their new and straighter positions. Band – A metal ring to which brackets or other orthodontic attachments can be connected to. Compared to brackets, bands are better able to withstand the forces of chewing so they are typically used on the back teeth. Bracket – A metal, ceramic, or plastic piece that is bonded to a tooth. The bracket contains a slot which the archwire fits into. Coil Spring – A spiral piece that fits over the archwire, in between two teeth. A coil spring opens space between the two teeth it pushes against. Elastic (Rubber Band) – A removable rubber band that attaches to hooks of the braces. 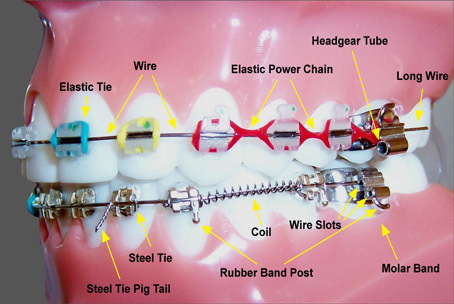 Elastics are used in many different ways and can move teeth in ways that braces alone cannot. Headgear Tube – A hollow tube to which the inner bow of the headgear fits into. Headgear tubes, when present, are typically found on the upper molar bands. Hook – An attachment for elastics. Hooks can be found connected to brackets and bands or attached to archwires. Separator (Spacer) – A rubber ring slightly larger than an O-tie that is placed in between two teeth. The purpose of separators is to create space for bands. Wire tie – A thin wire used to secure the archwire to the bracket.